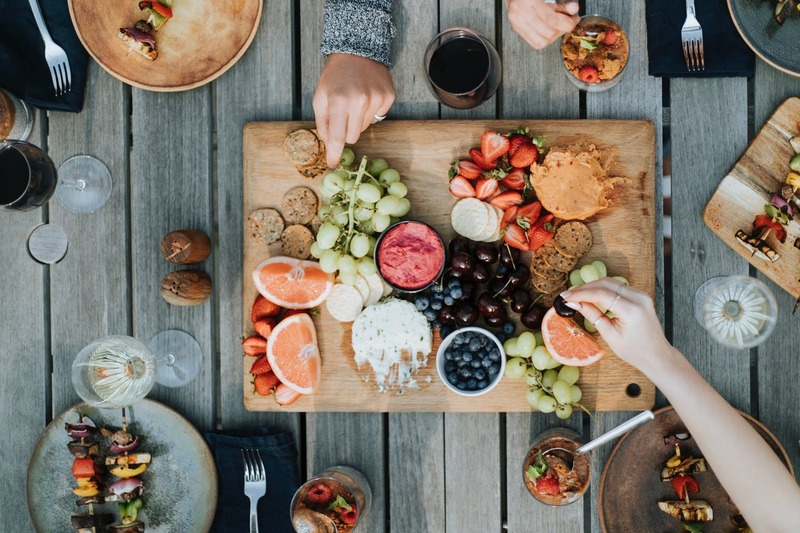 The Mediterranean diet was voted the best diet in 2019 by US News and World Report and it includes many foods that can help your health—but when it comes to eating healthy, this diet shows that it is not just about the food. People who follow this diet in Greece, Spain, and other Mediterranean countries might be healthy for other reasons. They tend to eat with others, pay attention to their food, and take their time to enjoy it. The social part of eating and how you think about food can be as important as the food itself! Eat together: Whether you have a large family, a roommate, or a pet, eat with someone and make your mealtime pleasant. Eat with your children: Research shows that eating meals as a family several times a week helps children get better grades. Children who eat with their families regularly are less likely to consume alcohol or illegal drugs. Be aware of family pressures and habits: Some families have strong traditions about food such as eating everything on your plate, overeating on special occasions, drinking a lot of alcohol or eating foods with a lot of fat, sugar, and salt. Your family members might say they want you to be healthy but try to get you to eat and drink what they normally do. Or they might say having obesity is OK because everyone in the family has it. Think about your own health, having less pain, and creating some new traditions for your family, including eating healthier foods and being more active. You can lead your family to a healthier and longer life. Plan your meals: Try to shop once a week so you have enough food for the whole week. Avoid making quick trips to the store or a fast food restaurant when you are hungry. When you do this, you are likely to buy processed foods that are high in salt, fat, and sugar. Keep healthy food at home or in your car to avoid this. Keep healthy foods at home: You might want to keep chicken in the freezer or brown rice in the pantry. Having nuts available for snacks gives you fats, protein, and vitamins. They are easy to pack on-the-go and can be consumed quickly. Have a backup plan: If you plan to cook from scratch but have to stay late at work, what will you do? Decide where to shop for healthier take-out food, or keep a couple of healthy items in the freezer or pantry that you can make quickly. Many fast food restaurants now have healthy options. You can check the menu online and choose healthy foods based on calorie count and other nutritional information, such as the amount of sodium or fat. Avoid planning complicated meals: It can be tempting to order takeout. Also, you might not cook for yourself often if it is a lot of work or you don’t enjoy it. Listen to your body: Your body will tell you when it is full, just as it tells you when you are tired and need sleep. This is another reason to pay attention to what you eat. You might want to keep eating, but know you will be too full if you do. In a restaurant, you can ask to have half your meal put in a box to take home. At home, you can put the food away and get some later if you really want it. There are several simple ways to get better at listening to your body. Some people have found that stopping when they feel “80 percent full” is a good way to stay mindful. Others find taking a few breaths or saying a prayer before taking a bite increases mindfulness while eating. Pick a method you like, and try it for 30 days. After that, it will become a habit. Try not to judge or think badly about yourself: Blaming yourself can make you feel helpless. It can also lead to eating high-calorie foods for comfort. If you have eaten inflammatory foods all your life, switching to anti-inflammatory foods will take some time. Don’t shop when you are hungry, tired or in a rush. Figure out your cooking style: Do you like using a Crock-Pot or instant pot? Cooking a lot of food in one day and storing it for later? Cook the way you enjoy doing it. Enjoy your treats: A piece of chocolate, a pastry, a hot dog, or a beer can all be enjoyable treats. Your goal is to avoid having so much of these foods that your body gets inflamed and stays that way. Instead, try eating these foods in smaller amounts and on special occasions. Really enjoy them if you like them. Remember, how you think about your food matters to your health, too! Don’t leave work hungry at the end of the day: Hunger might send you to the drive-through for a fast food snack instead of home to cook a healthy meal. Keep healthy “emergency snacks” in your bag or car, such as a piece of fruit, healthy popcorn, or a handful of unsalted nuts. Read the labels on energy bars carefully. They often contain a lot of sugar and are not healthy. Practice mindful eating: Eating while you watch TV, read a magazine, text or surf the web is common, but it’s a bad habit for health. This is because you are not usually aware of what you are eating during those times. When you eat, try paying attention to what you taste, smell, touch, hear, and see. This is called “mindful eating,” and it is a good way to enjoy your food more, reduce stress, and even eat less. For more advice on dieting habits and healthy eating, check out the Guide to Nutrition for Chronic Pain.